K-ras locus in human colon cancer cell line, HCT116, was knocked-out by creating indels in exon 4, as shown in the targeting strategy (Fig. 1). Viral encapsulation of Cas9 and gRNA delivery particles were carried out, viral titer was optimized for HCT116 cells. Individual clones were Sanger sequenced to select for homozygous knock-out indels of K-ras at exon 4. Sanger sequencing data (Fig. 2). 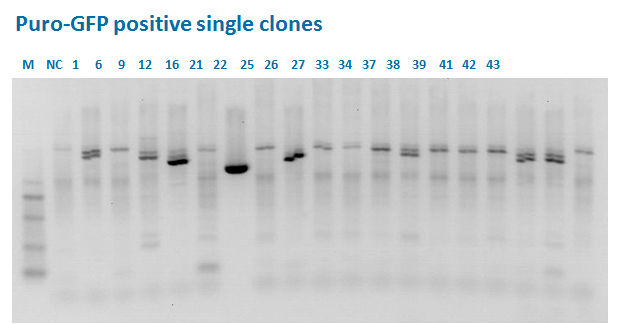 Absence of K-ras expression in the selected clone was confirmed via Western Blot (Fig. 3). A sequence optimized gRNA was designed and synthesized to target a specific region on the GS allele. DG44 cells were transfected with the construct and the cell pool was analyzed by Sanger sequencing. Several single clones were obtained and Sanger sequence analyzed. A single clone containing a frame shift mutation was carried forward (Fig. 1). The GS knockout clone was also analyzed for GS protein expression (Fig. 2). To assess loss of function, GS knockouts were grown in the presence or absence of increasing concentrations of glutamine (Fig. 3). GS knockouts were unable to grow in the absence of glutamine. However growth improved in the presence of increasing concentrations of glutamine, thereby indicating a functional loss in the GS knockout cell line. In conclusion, successful targeting of GS generated a single clone that was fully validated for lack of expression and GS function. AAVS1 locus in HEK 293T was used as knock-in target region. Donor DNA consisted of glucagon-like peptide 1 receptor (GLP-1R) with a puromycin selection marker, as shown in (Fig. 1). Cells were co-transfected with Cas9, gRNA and donor GLP-1R plasmids. Transfected cell pool was PCR analyzed and Sanger sequenced to determine whether there were GLP-1R positive clones. Cell pool was maintained under puromycin selection for 2 weeks and surviving cells were isolated. 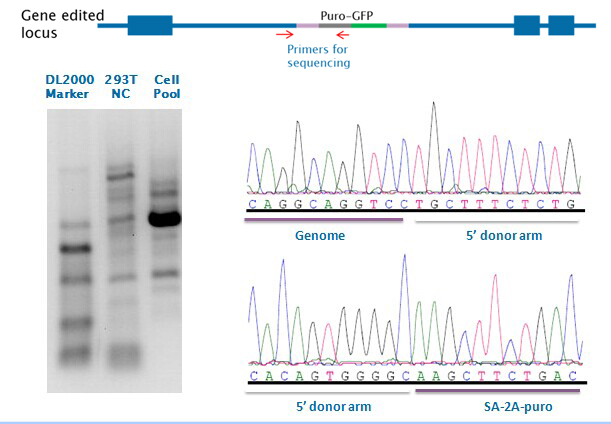 Individual clones were PCR analyzed for the Puro-GFP insert. A representative Sanger sequence of a positive clone is also shown (Fig. 2). GLP-1R protein expression was confirmed via immunocytochemistry staining and western blot analysis using an antibody specific to GLP-1R (Fig. 3). Figure 1. Integration strategy for GLP-1R insertion at targeted AAVS1 site. Figure 2. PCR analysis and Sanger sequencing of GLP-1R-positive clone. Left: M, 1 kb DNA ladder; A, B, C, PCR amplicon from GLP-1R transfected clones. Clone A is positive for GLP-1R integration at AAVS1 site. 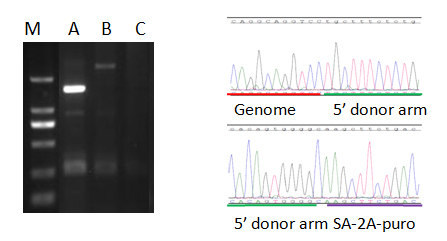 Right: Sanger sequencing confirmation of puro-GLP-1R insertion. Figure 3. GLP-1R expression in a representative GLP-1R clone by anti-GLP-1R antibody. Left: Immunofluorescent staining of GLP-1R positive clones (top) compared to control (bottom) using a GLP-1R antibody. Right: Western blot analysis of a GLP-1R positive clone, compared to negative control. Anti-GLP-1R antibody detects a ~40kDa band. AAVS1 locus in HEK 293T was used as knock-in target region. Donor DNA consisted of GFP and puromycin expression cassettes (Fig. 1). Cells were co-transfected with Cas9, gRNA and donor Puro-GFP plasmids. Control cells were co-transfected with Cas9 and Puro-GFP plasmids. GFP expression in cell pool was confirmed by fluorescence microscopy (Fig. 2). Cell pool was analyzed by PCR amplification using primers located outside of the homologous arm and on puromycin cassette. Amplified product was sequenced to confirm puromycin insertion (Fig. 3). Cell pool was treated with puromycin for 2 weeks. Single GFP-positive cells were isolated (Fig. 4). Individual clones were PCR analyzed for Puro-GFP insert. Clone 21 and several others were carried forward for sequence analysis (Fig. 5). Sanger sequencing of clone 21 shows insertion of the puromycin cassette at the targeted site (Fig. 6).